By 2040, Muslims are on track to be the second-largest religious group in the US. Think about that long and hard. 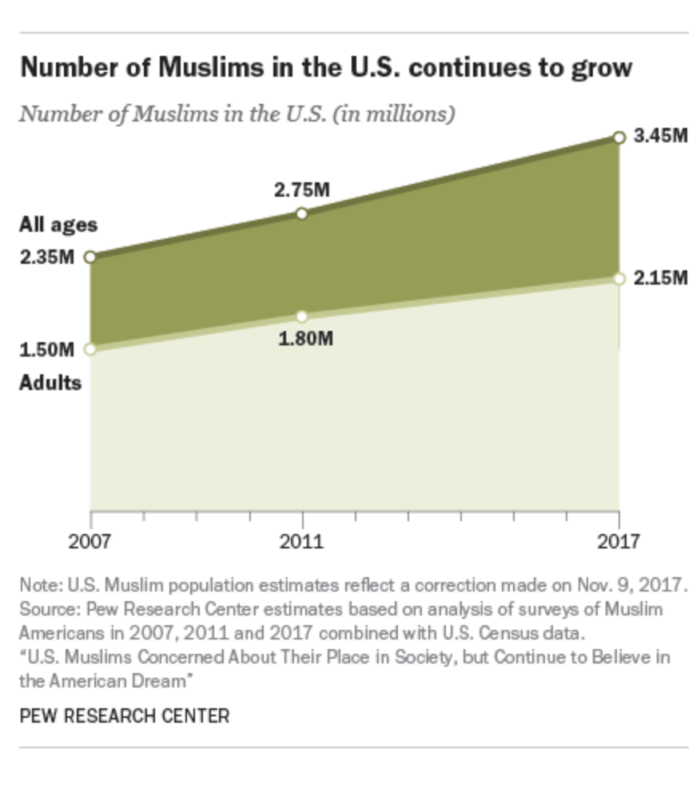 Estimates by Pew Research Center now conclude that there are roughly 3.45 million Muslims living in the US, making up about 1.1 percent of the total American population. That does not sound like a lot overall, but it is a scale tipper. Christians will remain the largest religious group in America. But Muslims will surpass Jewish-Americans as the second-largest group. Jews currently make up nearly 2% of the US population. 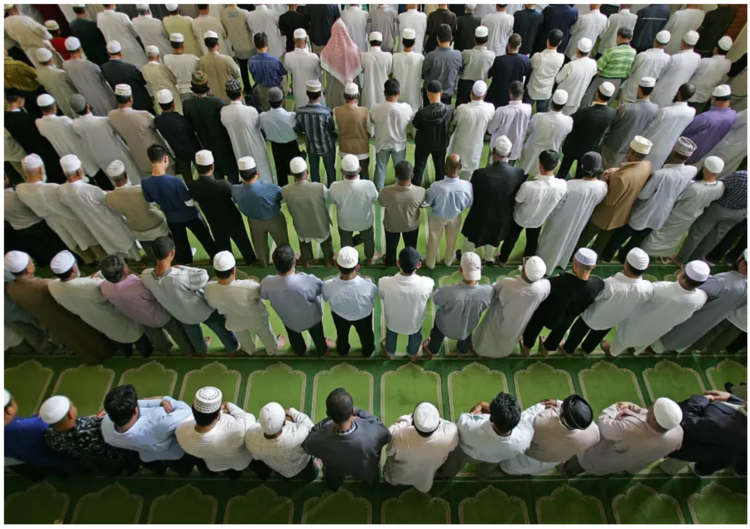 Hold on to your hats… Pew researchers estimate that the Muslim population will grow to an unprecedented 8.1 million, or 2.1 percent of the US population, by 2050. I’m all for religious freedom, but I don’t care for Islam. My personal opinion is that it embodies a violent ideology that is part and parcel of their religious teachings through the Quran and the Hadith. They are expanding at an exponential rate here in this US and if it keeps up, Obama’s claim that were are an Islamic nation may one day be reality. The Islamic population in the US has simply exploded since 2007. For example, in 2007, there were 2.35 million Muslims living in the US. Now, ten years later, the Muslim population has grown at a rate of about 100,000 per year due to high Muslim fertility rates and mass immigration from Muslim countries to the US. Pew Research estimates that the state of New Jersey has a Muslim population that is between two to three times the national average based on Muslim adults per capita. New Jersey has real issues these days and they can thank their politicians for all of it. That certainly includes Chris Christie. The US takes in more than 1.5 million foreign nationals every year. Most come here through chain migration, whereby naturalized citizens are allowed to bring an unlimited number of extended foreign family members to the country. In 2016, the legal and illegal immigrant population reached a record high of nearly 44 million. By 2023, the Center for Immigration Studies estimates that the legal and illegal immigrant population of the US will make up nearly 15 percent of the entire US population. That spells the end of freedom in this country and an end to the Republic. Islam is currently the second-largest religion in the world, after Christianity, with 1.8 billion adherents worldwide. Despite what the left will tell you, the philosophies of the two world’s biggest religions are at opposite ends of the spectrum. The Christian Bible is the polar opposite of the Quran. That’s a recipe for major conflict and we see it across the world right now. Christianity is a religion of peace and forgiveness, Islam is not. An earlier study from Pew found that American Muslims are just as concerned as the general public about extremism in the name of their religion; 83% of the general public said they were either somewhat or very concerned about the issue, with 82% of US Muslims saying the same. It’s a subject that Constitution-loving Americans would rather not discuss. But we had better have that discussion and soon. Countries are brought down in such ways.